By virtually every measure, 2018 was a superlative year for the securities industry in New York City, with profits up 11% on 2017’s already robust returns. For securities industry employees, however, end-of-year bonuses may have seemed decidedly lean, down almost 17% from the year before according to a New York State Comptroller estimate. Make no mistake: bankers are still making bank. 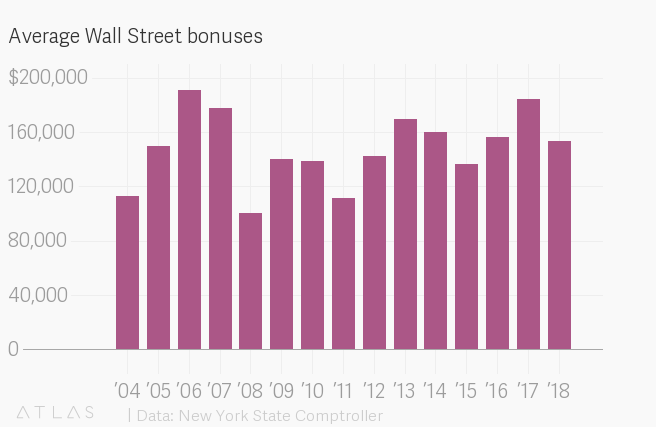 Bonuses on Wall Street were a sparkling $153,700, around double the average salary in the rest of New York’s private sector. But the dwindling numbers suggest those responsible for signing those checks may be spooked about what’s to come—and are playing a more defensive spending game. Those turbulent factors were already beginning to come into play toward the end of last year: 2018 saw the worst December for the Dow Jones Industrial Average in almost 90 years, while trading revenue was down 6% in the final quarter, after a 22% increase over the first three quarters. After years of solid growth and post-crash recovery, the future is beginning to look a little more uncertain. Bonuses are expected to fall another 9% in 2019, DiNapoli said. It’s bad news even for those who don’t expect a Wall Street bonus this year (or ever): Bankers think there’s something to be worried about. Any number of today’s newsworthy topics—political turmoil, China’s slowing growth, European chaos, climate change—could be enough to spark a sell-off, sending markets plummeting. If they do, Wall Street employees may find themselves more concerned about simply holding on to their jobs than the number of zeros on their bonus.